A while back I wrote a post about one of our new products: Galaxy. Recently we have contracted a number of projects for larger companies that involve building a knowledge management system, with Galaxy as the backbone. As we've shown Galaxy to our clients, we have been surprised to hear how excited they are about what Galaxy can do. Today we added Galaxy to the product listing on our website, although we are still waiting for a new and improved logo. Some of our customers' businesses are dependant on TK and Galaxy takes TK to a whole new level. Go check out the new page by clicking here or by visiting www.uts.com and clicking on Galaxy in the product catalog (link is on the left). This year, UTS President Jack Marathe will be making the trip out to DC to make two presentations on smart standards: one on Monday the 9th, to the ANSI Company Member Forum, and one on Tuesday the 10th, to SDO's (Standard Development Organizations). Thousands of standards are used every day by engineers in designing every conceivable product, from cell phones to cars to airplanes to electric motors. Hence, using such standards efficiently can save a huge amount of time. That is where smart standards come in. 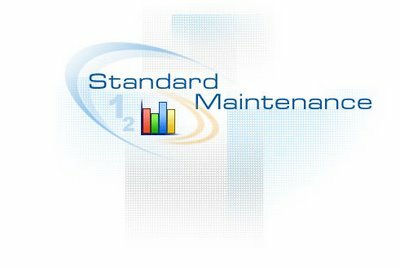 Smart standards are an online, interactive, customizable, instructive, easy to use, and convenient version of their traditional printed counterparts or Cd's. They often utilize automated tools, allowing the user to accomplish more things with the standard, such as making calculations or instantly accessing relevant resources. Jack Marathe will speak on exactly what is meant by "smart standards," what they are, how they are developed, how and why they are used, their costs, and their benefits. For more information, visit ANSI.org. Yesterday I talked about some of the external features of TeamKonnect. Today I'm going to give you a tour of what happens behind the scenes. TeamKonnect has a whole slew of administrative capabilities, and these functions are what really make TeamKonnect a powerful tool. 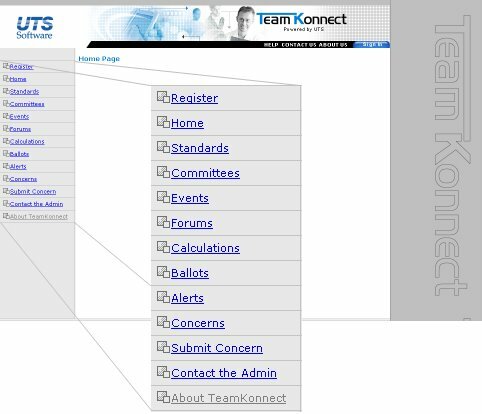 Any system could store a collection of Standards, but TeamKonnect makes them even more accessible by allowing admins to assign them to categories. Standards can be easily moved from category to category, and when it comes to finding a standard, it's that much easier. Standards are organized and indexed within two hierarchies, both of which are composed of multiple levels. These hierarchies are Subject Area and Business Area. The number of levels within each hierachy are up to the organization using the software. When it comes to Standards - the amount of work involved seems endless, especially when you consider the fact that most companies do not handle 1 or 2 Standards, but hundreds or thousands. Often there is an equally vast group of people who work on developing and updating these Standards as the industry and its expectations evolve. Committees and their members are handled in a similar fashion as Standards. TeamKonnect can organize members and keep track of information such as location, background, and expertise. Members can be added and removed from committees; Committees can be assigned and removed from Standards. It's as simple as click and drag. In addition to organizing the Standards and committees, admins can control all features available to external users. They can add and modify events, set up alerts, address concerns and schedule tasks. 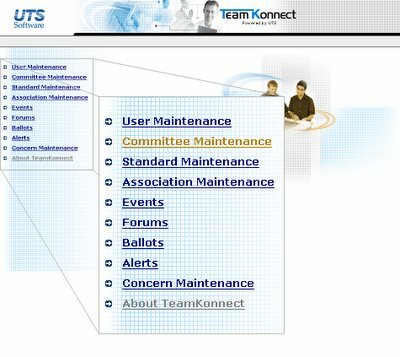 TeamKonnect's interface is intuitive and easy to use. Admin's will appreciate the extent of work they can accomplish in one single dashboard. Everyone will appreciate how much simple managing a library of Standards can be. One of UTS' most recent developments is TeamKonnect. The technical definition is Standards Development Process Management Software. Simply put, it's a web-based piece of software that assists people in developing standards or other large documents. TeamKonnect provides the customer with a way to keep track of deadlines, changes, team members, events and other related information. Ideal for both small and large standards devlopment organizations and corporations. Efficiently manages an unlimited number of standards or documents, as well as the committees and people who maintain them. Makes collaboration easier and more convenient. The front page looks something like this. I've magnified the menu on the left in order to show you the different areas external users have access to. Standards - Access public and assigned standards. View Standard History and reference material. Download the latest version and upload changes. Committees - View committee lists and committee member information. Events - View a personalized calendar of upcoming events. Forums - Discuss various topics surrounding the Standard with team members. 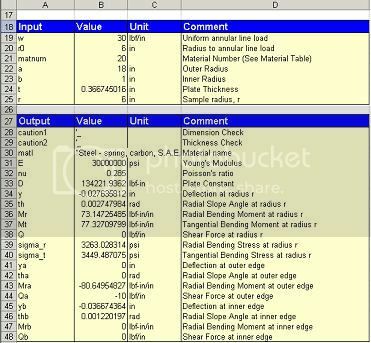 Calculations - Conduct simple or complex calculations using powerful, built in calculation tools. Ballots - Vote on changes, versions, and other decisions. Alerts - Recieve alerts from the administrator of important events or deadlines. Concerns - See a list of concerns you've submitted in the past. Submit Concern - Voice your concerns and recieve feedback. 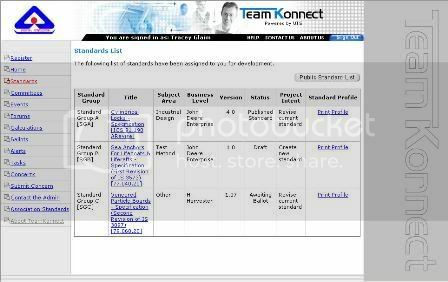 TeamKonnect has the ability to organize a virtually unlimited number of standards and users. Users can all log on to one place and access the latest versions of the Standards they have access to. They are given the tools they need to complete a variety of tasks. Communication, voting, and event planning are all made easy with TeamKonnect's email, forums, balloting system and calendar. Plus, everything is tracked for auditing purposes. For more information about TeamKonnect, visit www.UTS.com or give us a call at (815) 963-2220. Coming Soon: TeamKonnect Administrative Functionality. Continue with the annular plate from problem 4. To optimize the design, you would like to specify that the maximum deflection in the center be at most 10% of the plate thickness. You can use the Excel Solver to solve this problem. 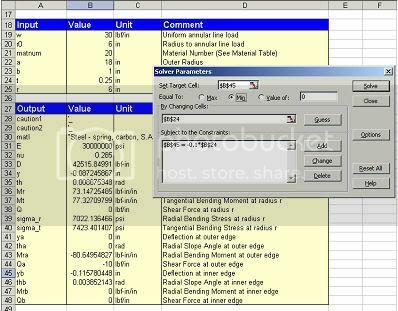 Specify the deflection output as the “Target” cell and use either the minimize or maximize option. Use the thickness cell as the “Changing” cell. Add a constraint that the deflection at the inner edge must equal -0.1 times the thickness and click Solve. After a few iterations, success! If you make the plate at least .367 inches thick, the deflection will be OK.